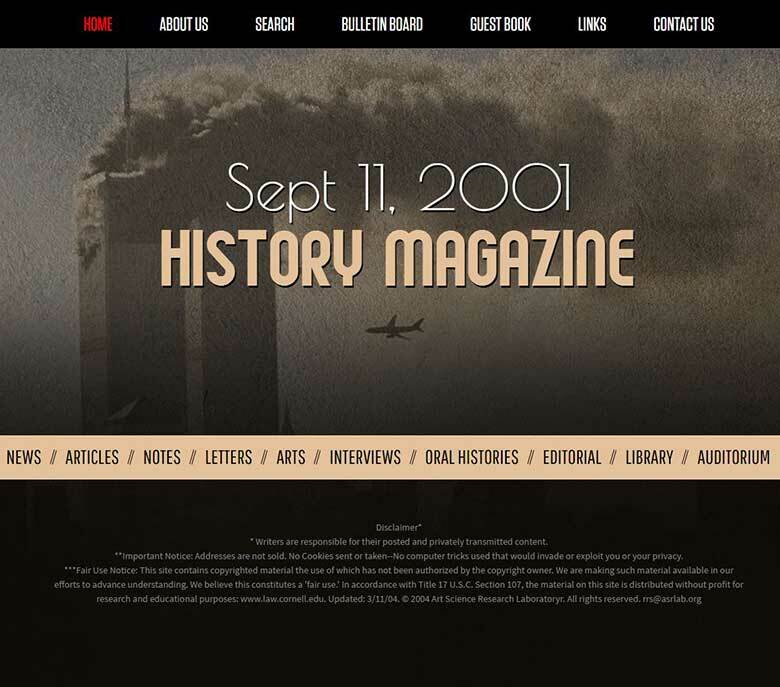 The Sept112001.org History Magazine is a perpetual multimedia magazine dedicated to stimulating dialog and creativity among scholars, artists, students, professionals, and all citizens. Although the magazine’s theme centers around the events of September 11, 2001, and their effects on our world, the magazine welcomes all types of submissions, from scholarly essays and fictional works to videotaped performances and other forms of artistic expression. Because the magazine appears on the global medium of the Internet, it encourages everyone to participate by submitting his or her own research, artwork, commentary, questions, or general feedback. 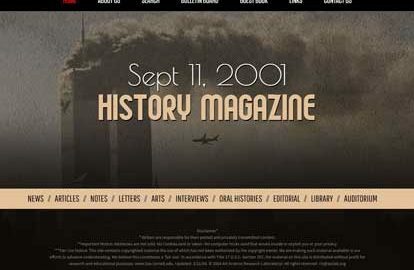 The Sept112001.org Oral History Project focuses on preserving the personal narratives of the many people involved with and affected by the events of September 11, 2001. The project records the experiences of survivors, rescue workers, families of victims, construction workers, civilian volunteers, eyewitnesses, and government officials. 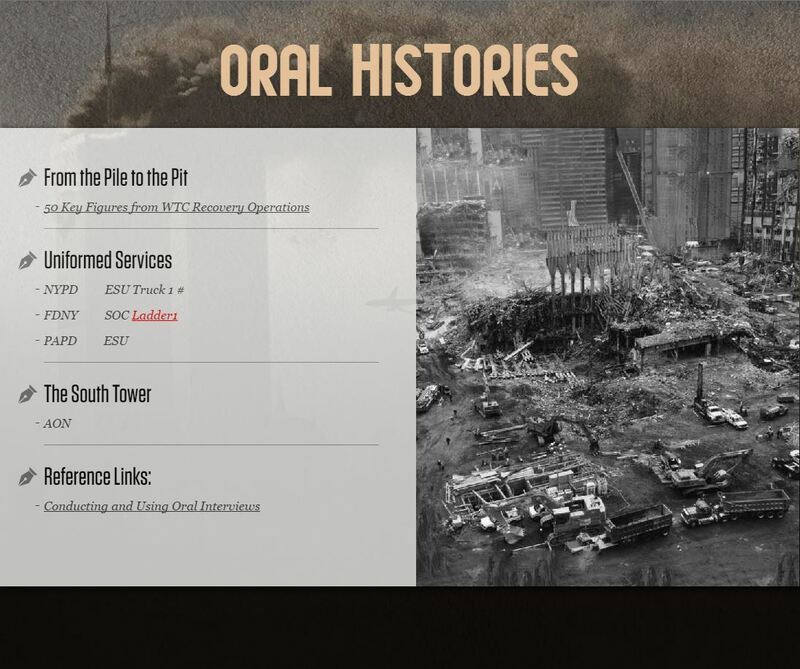 These oral histories cover numerous topics, from individual recollections of September 11 and accounts of the initial rescue efforts, to details of the recovery operations and stories of how these events affected people’s lives. Each person interviewed for the project can place photographs, artwork, and other memorabilia associated with September 11 in his or her personal digital archive. 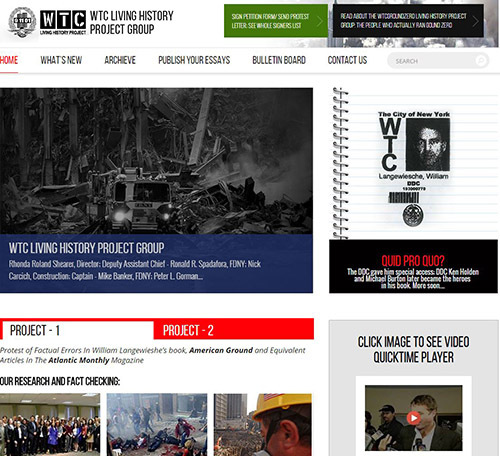 The WTC Living History Project is a reflexive effort to capture and analyze the historical facts surrounding the rescue and recovery at Ground Zero between September 11, 2001, and July 2, 2002 when the recovery operation officially ended. The project examines these facts from the perspectives of those who worked at and visited Ground Zero: engineers, firefighters, policemen, construction workers, rescue workers, and families of victims. 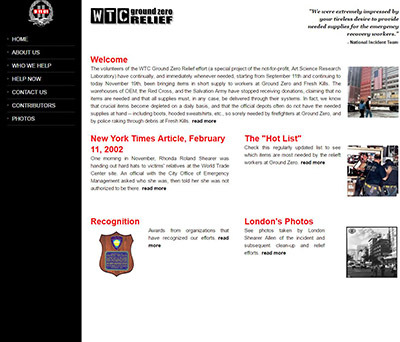 In addition to documenting history and disseminating information learned during the rescue and recovery efforts at Ground Zero, the project strives to correct misinformation circulated about those efforts, such as various errors in William Langewiesche’s book American Ground and his complementary articles in Atlantic Monthly. Between September 11, 2001 and June 25, 2002, the WTC Ground Zero Relief Project provided vitally needed supplies to rescue and construction workers at Ground Zero and the Fresh Kills landfill. In collaboration with corporations such as Timberland, Duracell, and Wal-Mart and foundations such as the Lions Club, Feed the Children, and the Rockefeller Foundation, the project delivered hardhats, boots, sweatshirts, gloves, safety glasses, food, and medical supplies directly to workers. Operating from a makeshift warehouse five minutes from Ground Zero, the project consulted with the Red Cross, the Salvation Army, FEMA, and other on-site agencies to address the immediate needs of workers.